MIT Comparative Media Studies researcher/instructor Chris Peterson is an adrent supporter of the Math Prize for Girls, and as part of his work with the organization, he's learned about the way that STEM fields were once considered inherently feminine, while the higher-status humanities were dominated by men -- it's the subject of some outstanding feminist scholarship by Professor Maria Charles. 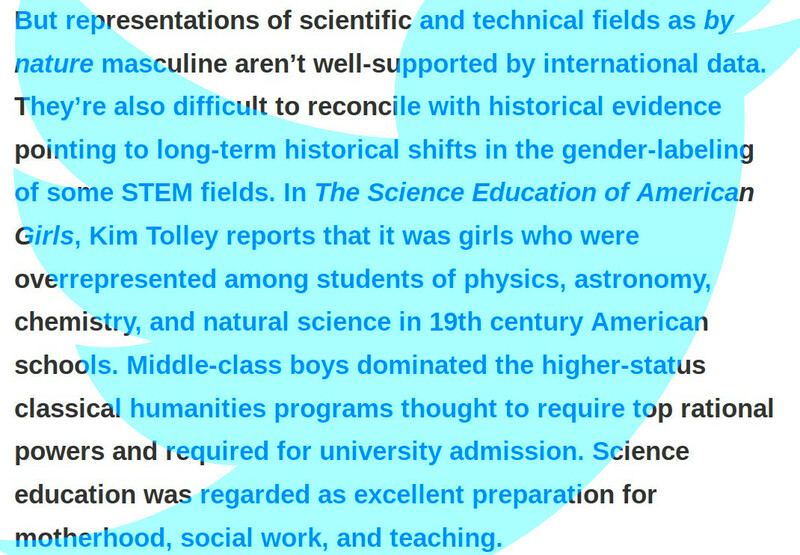 Peterson tweeted a quote from Maria Charles's work on the subject in a discussion of the upcoming Math Prize for Girls, and then found that his Twitter account had been suspended, without any explanation (he was given a chance to appeal the suspension, but has been told he might have to wait for days to find out what Twitter thought he did wrong). Peterson thinks he tripped over Twitter's new ban on "dehumanizing speech," which is meant to improve the quality of Twitter discourse by prohibiting Tweets that attack whole groups of people (formerly, Twitter banned attacking individuals on the basis of things like race or gender or sexual preferences, but not generalized racism, sexism, homophobia, etc). Peterson's explanation seems plausible: although his tweet was a condemnation of sexism, it did discuss gender norms through a critical lens, and an overbusy Twitter moderator might well have mistaken its meaning. One of the great ironies of moderation -- etiher human or algorithmic -- is that criticism of bad speech often contains examples of bad speech that can trip up moderators (for example, a complaint about being the subject of a racial slur might repeat the slur). Peterson is on the board of the nonprofit National Coalition Against Censorship, a charity that fights for free expression (NCAC helped me when one of my books was censored by a high school principal in Florida). He has recently argued for a relaxation of NCAC's "historic hard-line stance against social media intermediaries implementing any kind of steps to make their speech environments less toxic." because he is "deeply sympathetic to the arguments made by people, particularly members of historically subaltern groups, that a space where 'anything goes' reproduces preexisting power dynamics, and prevents members of these groups from participating on equal terms." But, Peterson writes, he also believes "that the implementation of these policies and processes can’t be this dumb." However, I also believe that the implementation of these policies and processes can’t be this dumb. I get that this is a really, really hard social and technical problem to solve. But any system that (apparently) flags feminist academic research about the social construction of scientific privilege as being abusive of women as a class is just not ready for production. And any such system, especially one as poorly designed as this, that keeps the reasons for disciplinary actions opaque, and obscures/delays the process of appealing an account to invisible moderators often working rapidly in inhumane conditions, does not meet the standard we must demand for the most powerful speech intermediaries in the world. Look: I won’t be harmed by a few hours or days without a Twitter account. In fact, in the current political environment, it might be an unexpected benefit, in the same way getting sick before my race forced me to taper more kept me from hurting myself. But I’m posting this because, as someone (again) who is super-sympathetic to what Twitter is trying to do, this is completely bonkers. And, in the long run, we have to hold our speech intermediaries to a high standard, even (especially) as we try to give them the space to design and cultivate more equitable environments for everyone to tell their stories. If we don’t, then we’re going to face the impossible choice between the free speech nihilism of “anything goes” or the capricious censorship of arbitrary algorithms. We can’t afford to accept either outcome.